Boston & Maine 1732 is a GP-9 1750 hp Diesel road switcher, built by GM’s Electro-Motive Division, May 1957 (#23230). Numbers 1700-1749 were built as “trade-in” locomotives, with B&M sending obsolete 1944-era FT road freight units to EMD for “remanufacture” into these GP-9 units. It was a bookkeeping exercise, as the GP-9 locomotives came right off the EMD production line. This locomotive was used in road and local freight service by B&M and, after the 1981 takeover, Guilford Transportation Industries. GTI renumbered it Springfield Terminal 68. The locomotive was transferred to a rail equipment leasing company in 1996, and was purchased by RMNE from the leasing company in August 1997 along with sister unit 66 (B&M 1728). 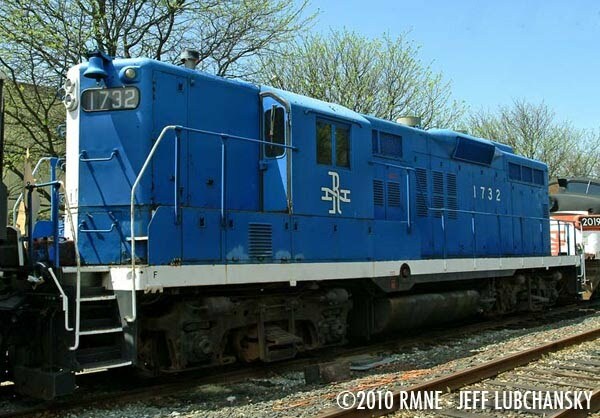 As B&M 1732, the unit was wrecked at Orange, Mass., in October 1973, and was rebuilt in 1974, apparently receiving a replacement short hood. The short hood now on the locomotive differs in detail (number of side doors) from standard GP-7, 9, 18, and 20 short hoods. #66 was sold in December 1997 to Massachusetts Central Railroad. #68 was painted and renumbered as 1732 in May 1998. The locomotive is currently in our shop undergoing a rebuilding and eventual return to service.